This is a draft of study guide based on SCSNI (Sun Certified Specialist Netbeans IDE) exam objectives. Installing a 3rd Party Plugin. How do I make my custom startup parameters permanent? 2.2 Demonstrate the ability to work with version control systems and the IDE. (Which VCS’s are available, which ones you need an external client for, how to pull sources out of a repository, view changes, and check them back in). SCSNI Study Group from Wagner R. Santos. GREAT work! 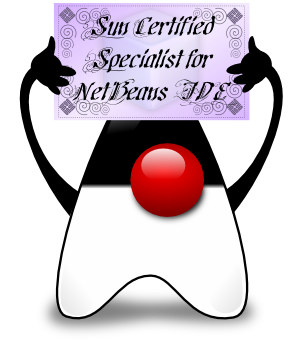 NetBeans Docs & Support. Home of best NetBeans documentation. Netbeans IDE Certification Exam Study Guide. A list of resources for SCSNI at NetBeans Wiki. NetBeans Screencasts. Just watching some of them (about 10 minutes each) can grantee you a lot of question in your exam. Please, collaborate in the comments with others resource links (with section number). Let’s complete this guide.